Fires raged out of control in Indonesia in 1997, spreading across 110,000 square kilometers (42,500 square miles) of forest. Researchers have found that people who were prenatal or 6 months old at the time did not grow to the expected average height by the time they were 17. Relative height has been found to have an impact on a person’s ability to earn an income, providing a new glimpse into the intergenerational cost of exposure to fire and haze. It was 1997, and while record fires were raging across Indonesia a new socio-economic crisis may have been quietly unfolding among the country’s infants and unborn children, according to a new study. The study, released earlier this week, suggests that the fires had a direct and irreversible impact on those babies: Their growth was stunted by up to 3.4 centimeters (1.3 inches) compared to the norm for other 17-year-olds, which in turn may have negatively affected their abilities to earn a comparable income. 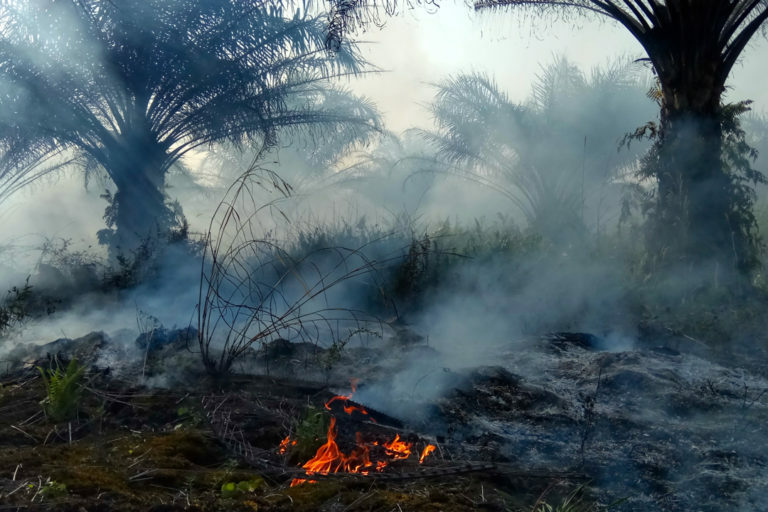 While the practice is generally illegal in Indonesia, companies and farmers alike use fire to clear land for oil palm and other crops. In 1997, a drought caused by El Niño rapidly spread what were intended as controlled, land-clearing fires. To arrive at this conclusion, the pair studied 560 children tracked since 1993 from the Indonesian Family and Life Survey (ILFS), a series of surveys conducted by the RAND Corporation, as well as the mothers’ residential records and their babies’ birth dates in particular districts to “identify the air pollution exposure for each fetus from August to October 1997, when the fires and air pollution were most intense,” they wrote. They then focused on the children’s heights when they were 3, 10 and 17 years of age. Fires engulf a palm oil plantation in Rokan Hilir district, Riau, Indonesia. Image by Zamzami/Mongabay Indonesia. While lower birth weight and premature birth are already known to be associated with air pollution, the evidence they gathered showed that the affected children were shorter at these subsequent three stages, too — and that directly affected their earning potential by up to 4 percent. “Consider the fact that 1.13 million individuals were in their prenatal stage during August through October 1997 in the impacted provinces of Sumatra or Kalimantan [Indonesian Borneo], where the air pollution and fires were most intense,” the authors wrote. For the authors of the Indonesia report, this loss of human capital could be addressed by using alternative methods to clear land for oil palm plantations. While Indonesian President Joko Widodo promised to tackle the issue of stunting in an address last year, he’s also campaigning on a pledge to increase palm oil production. In addition, fines levied against 11 companies that started fires to clear land have yet to be collected, and fires have continually been recorded across the country since massive blazes that ravaged the country again in 2015. The Indonesian ministries of health and environment did not respond to requests for comment before publication. Pattanayak said in an email that he hoped the study could help guide policymakers who are focused on short-term solutions. About the reporter: Lauren Crothers is a photo editor at Blink.la and a New York City-based freelance journalist with extensive reporting experience in Southeast Asia. You can find her on Twitter at @laurencro.